The face of the Washington press corps has changed markedly in recent years, transformed by an increase in the number of journalists working for “niche” publications and digital startups, while the ranks of reporters working for general interest local newspapers have continued to decline. A new Pew Research Center report – updating findings from a 2009 study of the Washington press corps – tracks the changes and explores the implications for local communities. 1 Credentialed reporters working for trade publications, specialty outlets and other niche news sources now outnumber daily newspaper reporters, according to the U.S. Senate Press Gallery. As recently as the late 1990s, daily newspaper staff outnumbered specialty journalists by more than two to one. 2There has been a sharp increase in the number of journalists working for digital news startups. 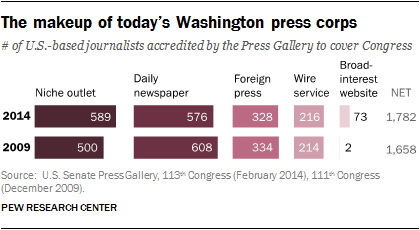 In 2009, fewer than three dozen journalists working for digital-native outlets were accredited to the Press Gallery. By 2014, the most recent year for which data are available, that number had risen to more than 130 – about a fourfold increase. This group of reporters is roughly split between those working for broad-interest publications such as The Huffington Post or Buzzfeed, and those working for niche outlets such as Kaiser Health News or Inside Higher Ed. 3The group of Washington-based reporters that produce local and regional coverage for local newspapers has shrunk. Between 2009 and 2014, 19 local newspapers disappeared from the Press Gallery books, reducing the number of states with any local newspaper staff on the hill from 33 to 29. The rolls of the Regional Reporters Association sit at 59 in 2015, down from around 200 in the mid-1990s. Bucking that trend, eight local papers re-established a presence in Washington between 2009 and 2014. And a handful of digital startups with correspondents in Washington, such as MinnPost, are locally oriented. Still, the challenge of sustaining Washington coverage of regional or local importance will not disappear in an era of decline in the newspaper industry: “If your financial condition as a metro paper is so dire that you can’t afford a local city hall reporter it’s pretty hard to justify a Washington correspondent,” remarked Andy Alexander – former Cox Washington bureau chief and Washington Post ombudsman. 4Washington-based correspondents for local outlets studied tend to focus heavily on Congress. Pew Research Center studied federal government coverage in eight different newspapers — four with their own D.C.-based correspondent, and four without. An analysis of federal government coverage by D.C. correspondents for four local newspapers finds that their coverage is more closely tethered to the institution and activities of Congress than federal government coverage by other types of reporters in the papers studied. From February to May of this year, D.C.-based correspondents for local papers were more likely to write about events having to do with Congress, with roughly half (52%) of their stories focusing on that branch of government. Other federal agencies drew a much greater share of coverage from other sources of government reporting that appeared in the papers, such as stories from staff not based in D.C. (46%), wires (39%) and other national media outlets (45%). In addition, about seven-in-ten stories produced by D.C. correspondents (71%) for these papers contained a quote from a member of Congress. 5 Wire services like the Associated Press account for the major share of federal government coverage in local newspapers. Regardless of whether a local newspaper has its own D.C. correspondent, wire service coverage carries much of the weight when it comes to informing readers about the federal government. 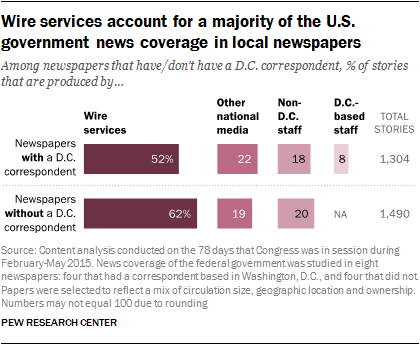 Among the four papers with a D.C. correspondent, fully 52% of stories about the federal government came from wire services, compared with 8% that came from the D.C. correspondents. Among four papers studied without their own D.C. correspondent, reliance on wire coverage was even more pronounced – accounting for fully 62% of all federal government news. Jesse Holcomb is an associate director of research at Pew Research Center.